With the contact wheel FAPI-PUS DENSE, the aluminium hub is coated with dense adjoining polyurethane foam lamellae. The height of the coating resp. the length of the polyurethane foam lamellae can be varied depending on the application (standard: 20 and 35 mm). 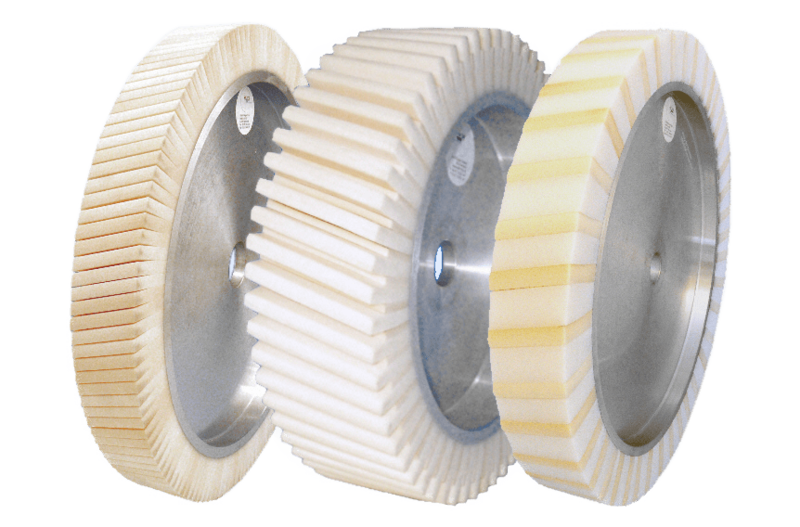 The polyurethane foam lamellae provide the contact wheel with a “running cushion” with which a fine finish is possible especially when working on (strongly) cambered and profiled parts. The coating adapts to every workpiece to be found. In addition, the contact wheel FAPI-PUS dense contributes in large measure to abrasive belt cooling because the spaces between the lamellae dissipate the heat generated during belt grinding. 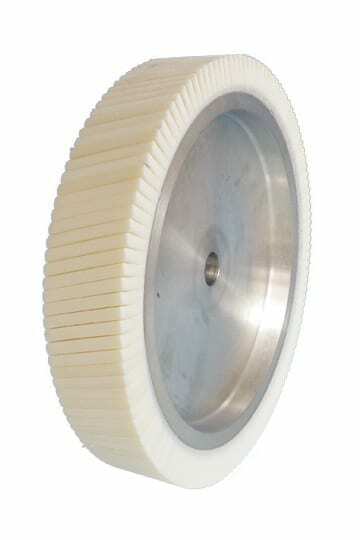 The contact wheels of the FAPI-PUS – series are coated only with polyurethane foam lamellae. Because of these outstanding properties, contact wheels of the FAPI-PUS – series have proven themselves in the market over decades. Our contact wheels FAPI-PUS DENSE are used in particular to achieve a high-quality finish on heavily profiled or heavily rounded parts in a very short time. The polyurethane foam lamellae are available in only one hardness of approx. 15º shore (A). The contact wheels FAPI-PUS – series are used if the hardness spectrum of the FAPI-VUS – series is no longer adequate.